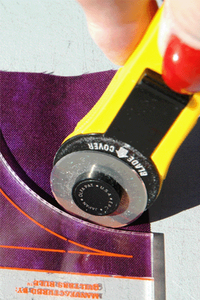 I recommend using the 28 mm Olfa, straight handle rotary cutter for the Creative Curves Rulers (4", 3", 2" and 1 1/2" circular curves). I recommend using the 18 mm Olfa, straight handle rotary cutter for cutting the concave or inside curve of the Creative Curves Ellipse Rulers (2" X 4" and 1 1/2" X 3" oval curves). The 28 mm rotary cutter will also work but the 18mm makes it much easier to cut the inside oval curves. 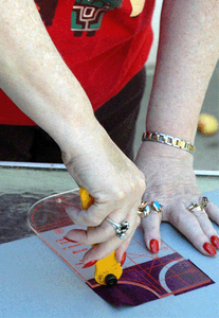 These photos are intended to help by showing 'how to' position your arm and wrist should be in when cutting the inside curves for either the circular or oval curves. The first photo shows 'how to' position your arm with your elbow up, instead of your arm being horizontal to the table. This is the secret to easily cutting inside curves. Cut with your hand and and arm almost perpendicular to the table (with just a slight angle back toward your body). This will place more direct force on the blade as it cuts through the fabric. In addition, less stress will be placed on your wrists, arms, and shoulders, thereby reducing the possibility of carpal tunnel problems. Always cut the 'points' first. The second photo shows the position for starting to cut the points. Look ahead of the blade while cutting (do not watch the blade) and turn your wrist while cutting (thinking - turn, turn, turn, etc). Once the points have been cut, then cut the rest of the curve. The reason it is important to cut the points first is that by cutting about 1" of fabric at the point, it will make sure that the seam allowance at the points will be accurate. Cut from the inside of the curve to the outside, away from the ruler. Cutting towards the outside, away from the curve, will ensure that the blade of the rotary cutter will not run into the ruler. These photos are intended to help by showing what I mean when I either write or talk about 'crossing over' the first seams. In this context, the first seam is the sewn curved seam (circular or oval). All first seams must be crossed to guarantee that the points will be sharp! It is essential that the first seams be crossed where ever they are sewn during the construction of the quilt- at the beginning of a seam, during a sean that sews a series of curved pieces together and at the end of a seam. The first photo shows where you would start sewing - starting on the inside of the first seam. It is important that the seam started to the left of the first (slightly wider than a 1/4" seam). The seam that is being sewn will cross the first seam at the 4th or 5th stitch (second photo). The second photo shows the 4th or 5th stitch where the first seam is being crossed. If the first seam is not crossed, there will not be a sharp point when the next seam is sewn. Three stitched is usually a 1/4" seam (the correct seam allowance). Sewing one or two stitches deeper (the 4th or 5th stitch) ensures that a sharp point will remain. This series of three photos are intended to help by showing what the position of the seams should be when the half-circles, half-ovals, and clam shells (circular or oval) are sewn (i.e. what they should look like when the seam is finished. For an example of this piecing technique, I have used a clamshell. The first photo shows the completed first seam folded towards the inside or 'center' of the curved piece. The seam from the other side of the clamshell is shown crossing the first seam with the last 1/4" of fabric underneath (not easily seen). The second photo shows how the second seam will look when it is also folded towards the 'center' of the piece. When the seams are all folded towards the 'center' they will lay flat (no clipping or snipping of the seam allowance will be needed). The third photo shows the sewn piece for the 'front'. There should be a small point (seen at the top of the clamshell), in fact if the point isn't there, it is not sewn correctly. This point will disappear when the next seam is sewn (1/4" seam allowance) and this next seam is what creates the circular or oval curve.